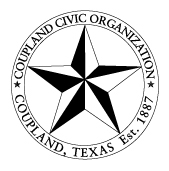 The Coupland Civic Organization will hold its monthly meeting on Monday, March 31, in the Fellowship Hall of St. Peter’s Church of Coupland. Bonnie and Leroy Sladek, organic gardeners and owners of Old Thyme Gardens, will discuss the spring garden and answer questions. Bonnie and Leroy presented an informative and entertaining program on organic gardening to the Civic Organization last April, and we are happy to welcome them back. Refreshments will be served at 6:30 p.m., and the program begins at 7. This entry was posted in Social, What's New? and tagged Bonnie & Leroy Sladek, Coupland Civic Organization, Old Thyme Gardens on March 28, 2014 by Stewart Dale Spencer.